As Emily quits her job we follow her antics on finding a new career. It is a classic chic lit read perfect for your next holiday or trip. There are some funny points that will having you laughing out loud. I listened to it as a audiobook which was easy to follow when I was drifting off to sleep which is my perfect time to listening to audiobooks. I really enjoyed reading about Emily and wanted her to be happy after her awful experience with her ex. It might make you think about following a career you have always been dreaming about. 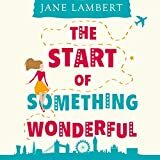 You can follow Jane Lambert on Twitter.